Min huvudsakliga forskning rör kartering, lokalisering och 3D-perception för mobila robotar: det vill säga hur en robot kan se sig omkring och veta var den är genom att bygga en karta, samt hur tredimensionella bilder kan användas i tillämpningar för mobila robotar, och hur de kan lagras och tolkas på ett effektivt sätt. Jag stöder the international committee for robot arms control och the campaign to stop autonomous military robots. Jag undervisar i kurserna Probabilistisk Robotik, Datorgrafik och Imperativ Programmering. Jag koordinerar också vårt internationella Master-programmet i robotik och intelligenta system. Gholami Shahbandi, S. & Magnusson, M. (2018). 2D map alignment with region decomposition. Autonomous Robots. Fan, H. , Kucner, T. P. , Magnusson, M. , Li, T. & Lilienthal, A. (2018). A Dual PHD Filter for Effective Occupancy Filtering in a Highly Dynamic Environment. IEEE transactions on intelligent transportation systems (Print), 19 (9), 2977-2993. Amigoni, F. , Yu, W. , Andre, T. , Holz, D. , Magnusson, M. , Matteucci, M. , Moon, H. , Yokozuka, M. & et al. (2018). A Standard for Map Data Representation: IEEE 1873-2015 Facilitates Interoperability Between Robots. IEEE robotics & automation magazine, 25 (1), 65-76. Almqvist, H. , Magnusson, M. , Kucner, T. P. & Lilienthal, A. (2018). Learning to detect misaligned point clouds. Journal of Field Robotics, 35 (5), 662-677. Gholami Shahbandi, S. , Magnusson, M. & Iagnemma, K. (2018). Nonlinear Optimization of Multimodal Two-Dimensional Map Alignment With Application to Prior Knowledge Transfer. IEEE Robotics and Automation Letters, 3 (3), 2040-2047. Almqvist, H. , Magnusson, M. & Lilienthal, A. J. (2014). Improving Point Cloud Accuracy Obtained from a Moving Platform for Consistent Pile Attack Pose Estimation. Journal of Intelligent and Robotic Systems, 75 (1), 101-128. Stoyanov, T. , Magnusson, M. & Lilienthal, A. J. (2013). Comparative evaluation of the consistency of three-dimensional spatial representations used in autonomous robot navigation. Journal of Field Robotics, 30 (2), 216-236. Stoyanov, T. , Magnusson, M. , Lilienthal, A. J. & Andreasson, H. (2012). Fast and accurate scan registration through minimization of the distance between compact 3D NDT Representations. The international journal of robotics research, 31 (12), 1377-1393. Magnusson, M. , Andreasson, H. , Nüchter, A. & Lilienthal, A. J. (2009). Automatic appearance-based loop detection from three-dimensional laser data using the normal distributions transform. Journal of Field Robotics, 26 (11-12), 892-914. Magnusson, M. , Lilienthal, A. J. & Duckett, T. (2007). Scan registration for autonomous mining vehicles using 3D-NDT. Journal of Field Robotics, 24 (10), 803-827. Magnusson, M. (2009). The three-dimensional normal-distributions transform: an efficient representation for registration, surface analysis, and loop detection. (Doctoral dissertation). Örebro: Örebro universitet. Fan, H. , Lu, D. , Kucner, T. P. , Magnusson, M. & Lilienthal, A. (2018). 2D Spatial Keystone Transform for Sub-Pixel Motion Extraction from Noisy Occupancy Grid Map. I: Proceedings of 21st International Conference on Information Fusion (FUSION). Konferensbidrag vid 21st International Conference on Information Fusion (FUSION), Cambridge, UK, July 10 - 13, 2018 (ss. 2400-2406). Swaminathan, C. S. , Kucner, T. P. , Magnusson, M. , Palmieri, L. & Lilienthal, A. (2018). Down the CLiFF: Flow-Aware Trajectory Planning under Motion Pattern Uncertainty. I: 2018 IEEE/RSJ International Conference on Intelligent Robots and Systems (IROS). Konferensbidrag vid 31st IEEE/RSJ International Conference on Intelligent Robots and Systems (IROS), Madrid, Spain, October 1-5, 2018 (ss. 7403-7409). Institute of Electrical and Electronics Engineers (IEEE). Andreasson, H. , Adolfsson, D. , Stoyanov, T. , Magnusson, M. & Lilienthal, A. (2017). Incorporating Ego-motion Uncertainty Estimates in Range Data Registration. I: 2017 IEEE/RSJ International Conference on Intelligent Robots and Systems (IROS). Konferensbidrag vid IEEE/RSJ International Conference on Intelligent Robots and Systems (IROS 2017), Vancouver, Canada, September 24–28, 2017 (ss. 1389-1395). Institute of Electrical and Electronics Engineers (IEEE). Palmieri, L. , Kucner, T. , Magnusson, M. , Lilienthal, A. & Arras, K. (2017). Kinodynamic Motion Planning on Gaussian Mixture Fields. I: IEEE International Conference on Robotics and Automation (ICRA 2017). Konferensbidrag vid IEEE International Conference on Robotics and Automation (ICRA 2017), Singapore, May 29 - June 03, 2017. IEEE. Zaganidis, A. , Magnusson, M. , Duckett, T. & Cielniak, G. (2017). Semantic-assisted 3D Normal Distributions Transform for scan registration in environments with limited structure. I: 2017 IEEE/RSJ International Conference on Intelligent Robots and Systems (IROS). Konferensbidrag vid 2017 IEEE/RSJ International Conference on Intelligent Robots and Systems (IROS 2017), Vancouver, Canada, September 24-28, 2017 (ss. 4064-4069). IEEE Robotics and Automation Society. Magnusson, M. , Kucner, T. P. , Gholami Shahbandi, S. , Andreasson, H. & Lilienthal, A. (2017). Semi-Supervised 3D Place Categorisation by Descriptor Clustering. I: 2017 IEEE/RSJ International Conference on Intelligent Robots and Systems (IROS). Konferensbidrag vid 2017 IEEE/RSJ International Conference on Intelligent Robots and Systems (IROS 2017) Vancouver, Canada, September 24–28, 2017 (ss. 620-625). Institute of Electrical and Electronics Engineers (IEEE). Triebel, R. , Arras, K. , Alami, R. , Beyer, L. , Breuers, S. , Chatila, R. , Chetouani, M. , Cremers, D. & et al. (2016). SPENCER: A Socially Aware Service Robot for Passenger Guidance and Help in Busy Airports. I: David S. Wettergreen, Timothy D. Barfoot, Field and Service Robotics Results of the 10th International Conference. Konferensbidrag vid 10th International Conference on Field and Service Robotics (FSR), Toronto, Canada, June 23-26, 2015 (ss. 607-622). Springer. Magnusson, M. , Vaskevicius, N. , Stoyanov, T. , Pathak, K. & Birk, A. (2015). 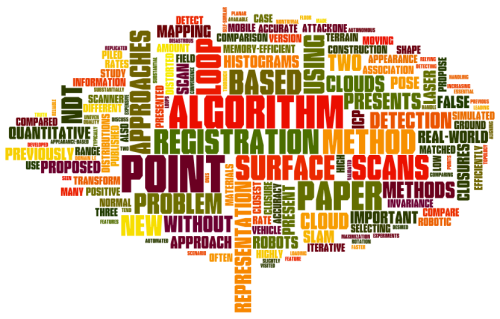 Beyond points: Evaluating recent 3D scan-matching algorithms. I: 2015 IEEE International Conference on Robotics and Automation (ICRA). Konferensbidrag vid 2015 IEEE International Conference on Robotics and Automation (ICRA), Seattle, USA, May 26-30, 2015 (ss. 3631-3637). IEEE conference proceedings. Magnusson, M. , Kucner, T. & Lilienthal, A. J. (2015). Quantitative Evaluation of Coarse-To-Fine Loading Strategies for Material Rehandling. I: Proceedings of the IEEE International Conference on Automation Science and Engineering (CASE). Konferensbidrag vid IEEE International Conference on Automation Science and Engineering (CASE), Gothenburg, Sweden, August 24-28, 2015 (ss. 450-455). New York: IEEE conference proceedings. Kucner, T. P. , Magnusson, M. & Lilienthal, A. J. (2015). Where am I? : An NDT-based prior for MCL. I: 2015 European Conference on Mobile Robots (ECMR). Konferensbidrag vid 7th European Conference on Mobile Robots, Lincoln, England, September 2-4, 2015. New York: IEEE conference proceedings. Kucner, T. , Sarinen, J. , Magnusson, M. & Lilienthal, A. J. (2013). Conditional transition maps: learning motion patterns in dynamic environments. I: IEEE/RSJ International Conference on Intelligent Robots and Systems. Konferensbidrag vid IEEE/RSJ International Conference on Intelligent Robots and Systems (ss. 1196-1201). IEEE. Almqvist, H. , Magnusson, M. , Stoyanov, T. & Lilienthal, A. J. (2013). Improving Point-Cloud Accuracy from a Moving Platform in Field Operations. I: 2013 IEEE International Conference on Robotics and Automation (ICRA). Konferensbidrag vid 2013 IEEE International Conference on Robotics and Automation (ICRA, 6-10 May, Karlsruhe (ss. 733-738). IEEE conference proceedings. Stoyanov, T. , Magnusson, M. & Lilienthal, A. J. (2012). Point Set Registration through Minimization of the L-2 Distance between 3D-NDT Models. I: 2012 IEEE International Conference on Robotics and Automation (ICRA). Konferensbidrag vid 2012 IEEE International Conference on Robotics and Automation (ICRA), Saint Paul, MN, 14-18 May 2012 (ss. 5196-5201). IEEE conference proceedings. Magnusson, M. & Almqvist, H. (2011). Consistent pile-shape quantification for autonomous wheel loaders. I: 2011 IEEE/RSJ International Conference on Intelligent Robots and Systems. Konferensbidrag vid IEEE/RSJ International Conference on Intelligent Robots and Systems SEP 25-30, 2011 San Francisco, CA (ss. 4078-4083). Stoyanov, T. , Magnusson, M. , Almqvist, H. & Lilienthal, A. J. (2011). On the Accuracy of the 3D Normal Distributions Transform as a Tool for Spatial Representation. I: 2011 IEEE International Conference on Robotics and Automation (ICRA). Konferensbidrag vid IEEE INTERNATIONAL CONFERENCE ON ROBOTICS AND AUTOMATION (ICRA),Shanghai, PEOPLES R CHINA,MAY 09-13, 2011.. IEEE conference proceedings. Stoyanov, T. , Magnusson, M. , Andreasson, H. & Lilienthal, A. J. (2010). Path planning in 3D environments using the normal distributions transform. I: IEEE/RSJ 2010 International Conference on Intelligent Robots and Systems (IROS 2010). Konferensbidrag vid IEEE/RSJ International Conference on Intelligent Robots and Systems, Taipei, Taiwan Oct 18-22, 2010 (ss. 3263-3268). IEEE conference proceedings. Magnusson, M. , Andreasson, H. , Nüchter, A. & Lilienthal, A. J. (2009). Appearance-based loop detection from 3D laser data using the normal distributions transform. I: IEEE International Conference on Robotics and Automation 2009 (ICRA '09). Konferensbidrag vid IEEE International Conference on Robotics and Automation, 2009 (ICRA '09), Kobe, Japan, May 12-17, 2009 (ss. 23-28). IEEE conference proceedings. Magnusson, M. , Nüchter, A. , Lörken, C. , Lilienthal, A. J. & Hertzberg, J. (2009). Evaluation of 3D registration reliability and speed: a comparison of ICP and NDT. I: Proceedings of the 2009 IEEE international conference on Robotics and Automation, ICRA'09. Konferensbidrag vid 2009 IEEE International Conference on Robotics and Automation (ICRA'09), Kobe, Japan, May 12-17, 2009 (ss. 2263-2268). IEEE conference proceedings. Magnusson, M. , Nüchter, A. , Lörken, C. , Lilienthal, A. J. & Hertzberg, J. (2008). 3D mapping the Kvarntorp mine: a rield experiment for evaluation of 3D scan matching algorithms. I: IEEE/RSJ International Conference on Intelligent Robots and Systems (IROS), Workshop. Konferensbidrag vid IEEE/RSJ International Conference on Intelligent Robots and Systems (IROS), Workshop "3D Mapping", Nice, France, September 2008. Huhle, B. , Magnusson, M. , Straßer, W. & Lilienthal, A. J. (2008). Registration of colored 3D point clouds with a Kernel-based extension to the normal distributions transform. I: 2008 IEEE international conference on robotics and automation. Konferensbidrag vid IEEE international conference on robotics and automation, ICRA 2008, Pasadena, CA, USA, 19-23 May 2008 (ss. 4025-4030). New York, NY, USA: IEEE. Andreasson, H. , Magnusson, M. & Lilienthal, A. (2007). Has something changed here? : Autonomous difference detection for security patrol robots. I: 2007 IEEE/RSJ international conference on intelligent robots and systems. Konferensbidrag vid IEEE/RSJ international conference on intelligent robots and systems, 2007, IROS-2007, San Diego, USA, Oct. 29-Nov. 02, 2007 (ss. 3429-3435). New York, NY, USA: IEEE. Magnusson, M. , Duckett, T. , Elsrud, R. & Skagerlund, L. (2005). 3D modelling for underground mining vehicles. Konferensbidrag vid The Conference on Modeling and Simulation for Public Safety, SimSafe, 2005 Linköping, Sweden. Magnusson, M. & Duckett, T. (2005). A comparison of 3D registration algorithms for autonomous underground mining vehicles. Konferensbidrag vid 2nd European Conference on Mobile Robots, ECMR 2005, Ancona, Italy, September 7-10. Magnusson, M. (2006). 3D Scan Matching for Mobile Robots with Application to Mine Mapping: Licentiate Thesis. Lic.-avh. Örebro University.